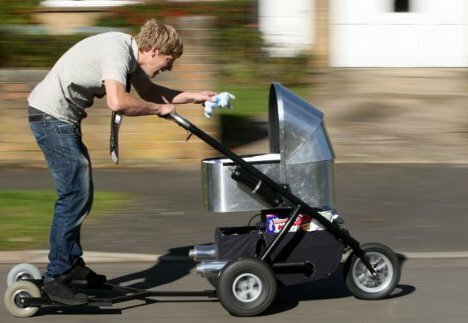 Everyone who has ever tried to push a baby in a stroller up a hill has probably wished for an invention like this. 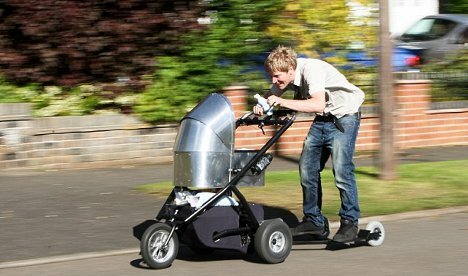 A new father from the UK spent a few weeks and a few hundred pounds building a motorized metal stroller that can reach the eye-watering speed of 50 MPH. The stroller has buttons on its handle to turn the engine on and off, levers to control the speed, and a platform on which the driver can stand while pushing a baby down the street at breakneck speed. Let’s just hope baby is wearing a helmet when dad decides to take him out for a little stroll. Thankfully, the inventor’s girlfriend has not allowed him to drive the insane stroller with their infant son inside. He has tested it out on the streets, but only with a doll inside – which is a very good thing since he admits that the stroller is not entirely stable, especially at high speeds.